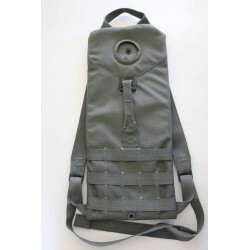 US Military Molle 100 oz 3 Liter Hydration Carrier Backpack. No water bladder is included in this listing. Official US Military Hydration Carrier Backpack. 100 oz capacity or 3 Liters. Top carry handle. Center carry handle. Padded foam back and front for a more comfortable carry. Government Contractor: The Specialty Group, Inc. Size: 18" Height x 7.5" Wide.